Herbs – you’ve paid for the whole bunch, right? You might as well get your money’s worth and put them to good use. 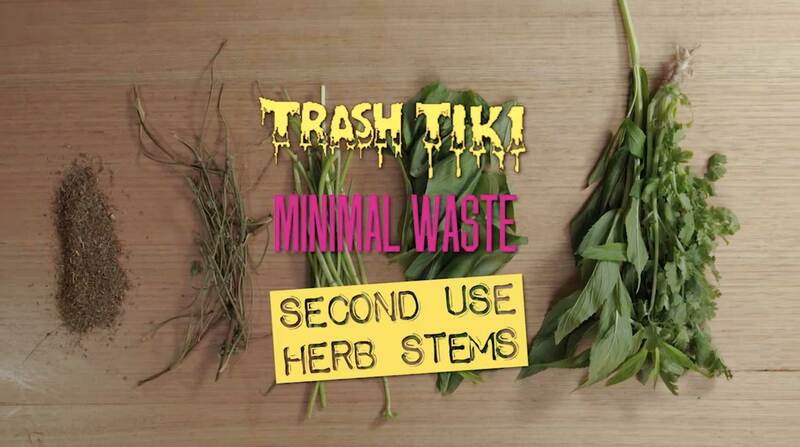 Here’s how with Trash Tiki’s ‘second use’ recipes. It’s OK, we get it. You’ve been been conditioned to think that the remainder of the plant is rubbish after you’ve just picked the night’s truck load of mint leaves. But the truth is that, while those leaves may be pretty, the stems that they grow on are packed with flavour (sometimes more than the leaf) and shouldn’t go to waste. Even in cooking, every recipe ever says to pick the leaves and tender stems from a bunch of herbs and trash the rest. The Trash Tiki duo of Iain Griffiths and Kelsey Ramage are sharing their easy minimal waste practices with the world. Having just departed Australia, they partnered with The Blends of the World earlier in the year to educate the industry on waste management. Here’s a simple second use recipe to add to your repertoire. Want to see more videos log on to www.the-blend.com.au.